"Is it Lisa or Lesser?" we ask the staff at Lesa. Although we can't arrive at a definite conclusion (staff say both), there's certainly a feeling of excitement that we are dining at Melbourne's hottest new spot. 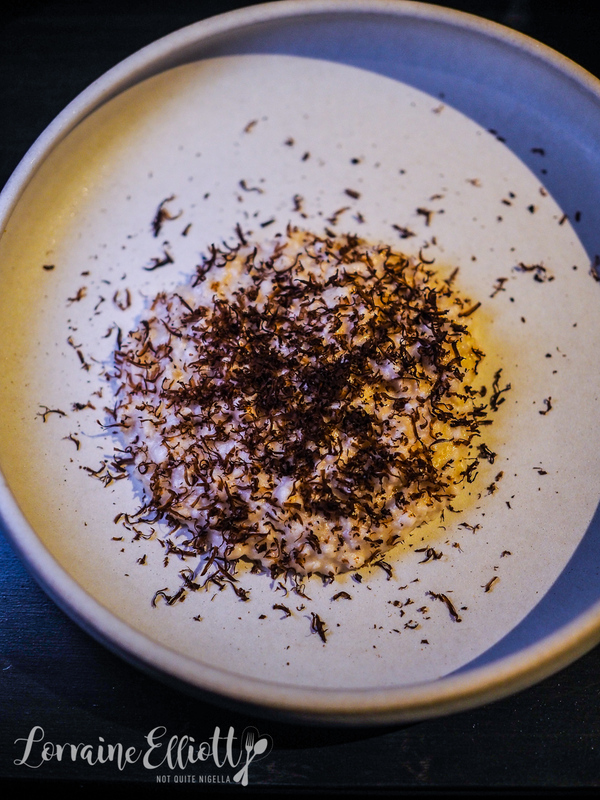 With the accolades from Embla behind them, the team at Lesa (located upstairs on top of Embla) have struck out with a slightly more formal format with a 4 course menu with a great, accessible wine list to match. Lesa is Old Norse for "gathering place". Sofia and I are the first to arrive at 5:30pm and we are shown to the corner table in the main room. Lesa's co-owners are front of house Christian McCabe and chef Dave Verheul. By 6:30pm all tables will be taken. Service is really friendly in that Melbourne way where they actually properly chat and listen for answers which is really nice. The menu is simple-four courses for $78 per person with three choices in each with one vegetarian course among them. There are a few extra choices too more in the way of bread and sides. Sofia and I let them choose the wine for us based on what we've ordered and we start with a glass of wine from their extensive wine list. The extra bread course was made for a day such as this where the morning temperature was zero. 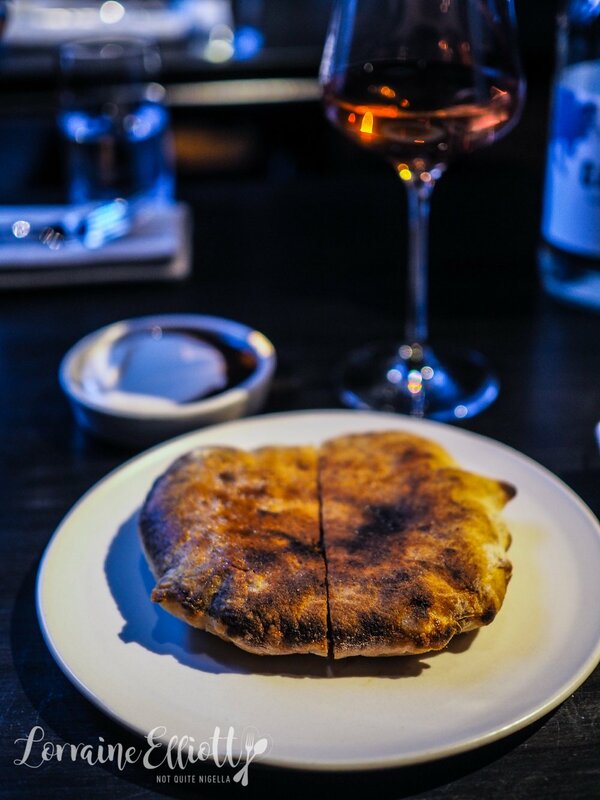 The fermented potato flat bread smells of the hearth and the lick of browned butter. It is like being hugged in the best way possible and it's just so perfect dipped in the shiitake jus and macadamia cream. Sure we've been at it heavy handed in the dipping stakes (so much so that we needed another serve of shiitake and macadamia cream) but the cold will do that to you. It will also make you hug random people I've learned. The next dish is so pretty that it almost hurts to cut into it. Which is silly of me because that defeats the point of ordering food. It's a chioggia Italian and purple beetroot that has been sliced in a meat slicer and then layered in an ombre pattern. It is then salted with pink thyme, baked and then compressed. It is served on a bed of red onion sauce blended with cherry vinegar and mustard and oil. There are also olives and salted elderberries that were from the last summer that were salt preserved in the same way that capers are. It's refreshing but mild and slightly earthy although Sofia thinks that it's perhaps best a dish served in Summer. She quips, "I didn't want to be refreshed I wanted to be hugged and told that everything was going to be warm and ok." See? Winter will make you want hugs. 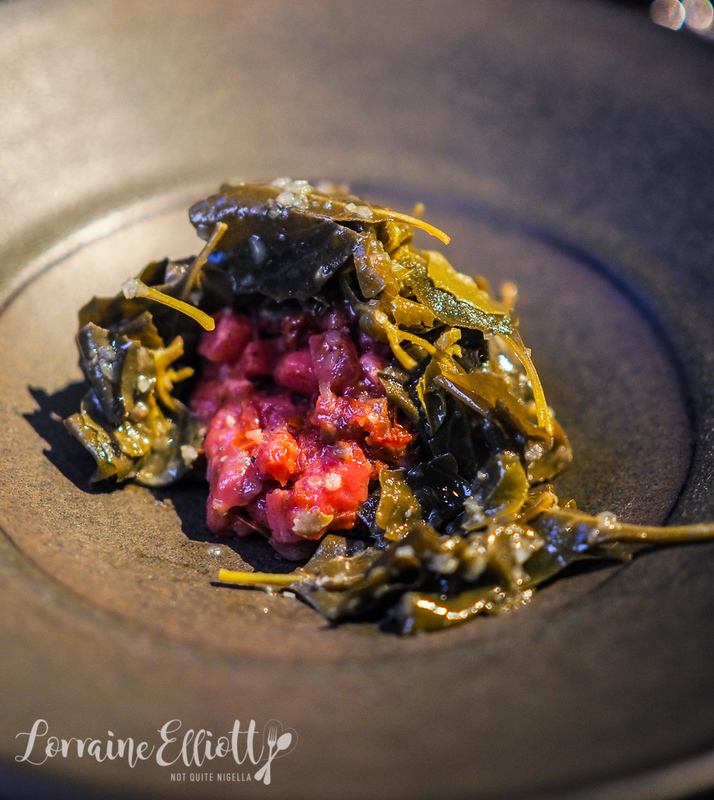 The veal tartare is hidden underneath a topping of braised saltbush leaves. Inside there is finely diced veal with a wild rocket paste and summer tomatoes. 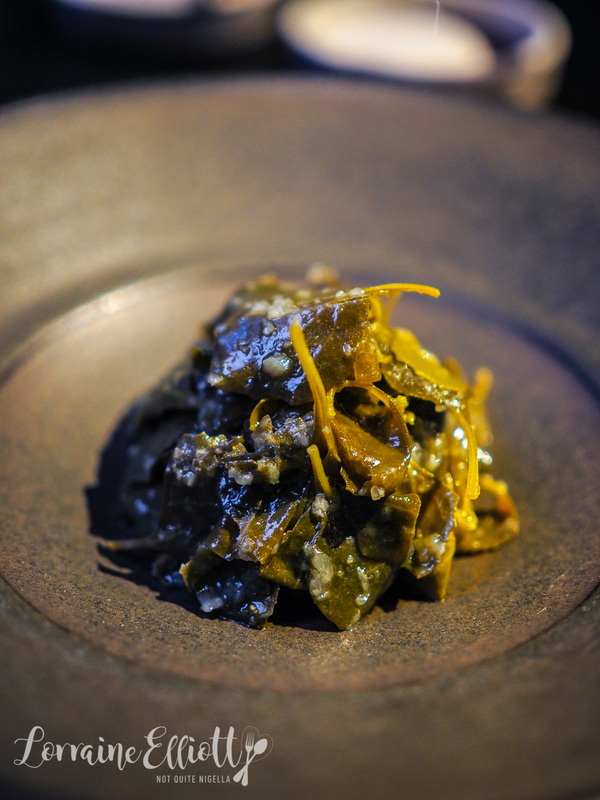 It's a nice dish with a good amount of acidity to it and reminds us of dolmades. The second course of items arrive and we're both fans of the chicken porridge which is actually made without rice or oats. Dave explains, "We poach the chicken until just cooked and then we mince the chicken finely and then mix it to order with an almond milk and breadcrumbs from our sourdough bread leftovers, a bit of garlic and shallot until it becomes a porridge consistency." On top is a finely shaved black chestnut which they have made in house in the same way that black garlic is made with bold dark balsamic notes. We were tossing up between this and the arrow squid but we were recommended this. 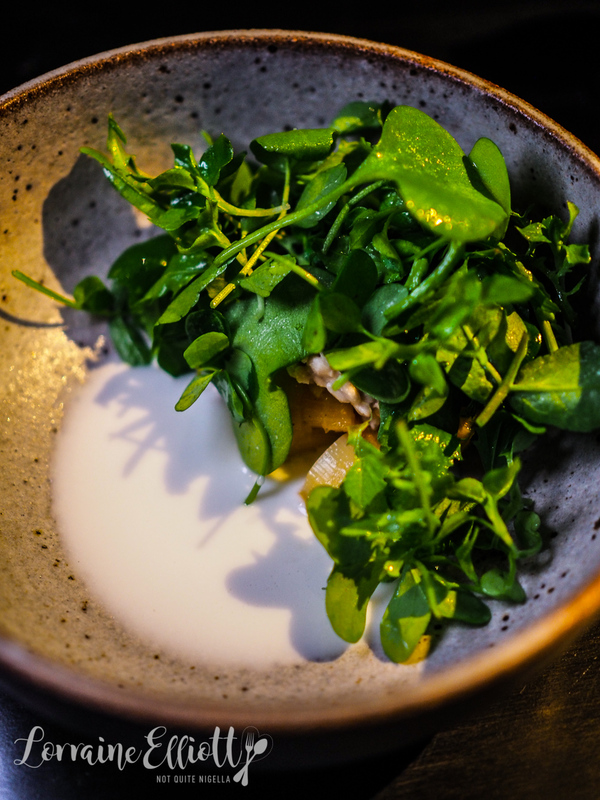 It's a vegetarian dish with soft grilled leek, horseradish and slow cooked sunflower seeds that end up tasting like a grain in texture underneath a covering of wild herbs. At the table they pour four-week-old fermented goat’s milk. The third course comes out and this is our favourite course. The line caught brain spiked Hapuka or Ikejime is a luscious fillet perfectly cooked. Their method is cooking it to get that wonderful texture is to sit the fish next to the fire to set the protein in a similar way to sous vide but this method also gives the outside of the fillet texture. 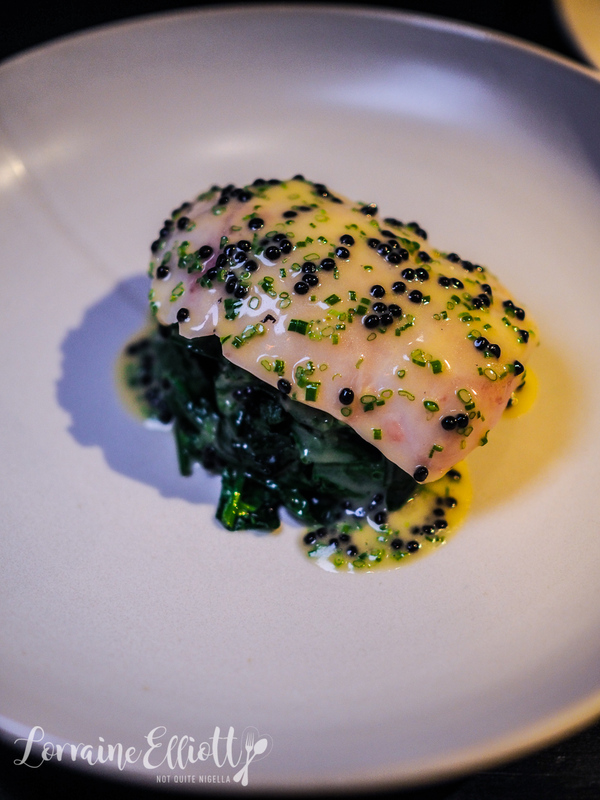 This dish is really about textures and soft textures at that. There are soft confit chunks of shallot and soft cooked English spinach. There is also a fermented fennel butter, a modernised beurre blanc made with fermented fennel juice, wine and butter. 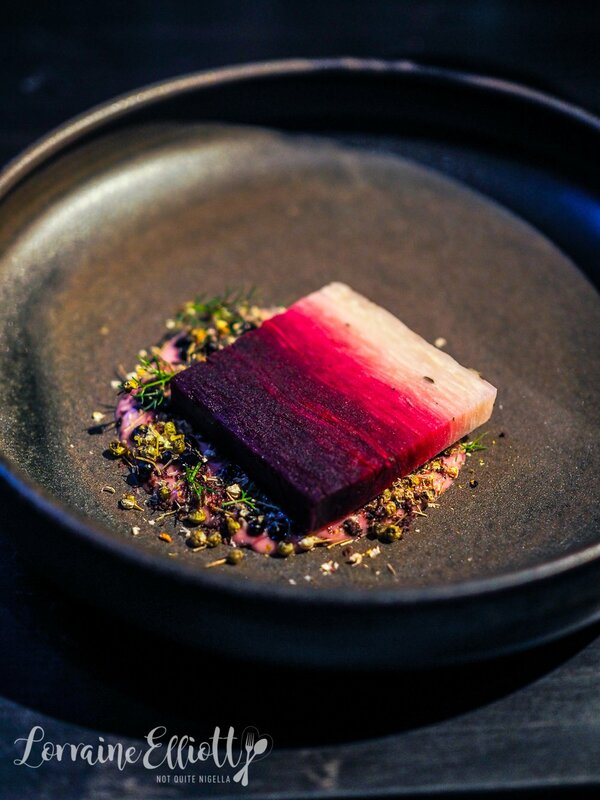 The aged Kurobuta black Berkshire pork loin is a thick meltingly soft slice of pork that is slow cooked on the hearth in a similar way to the hapuka for up to 1.5 hours. 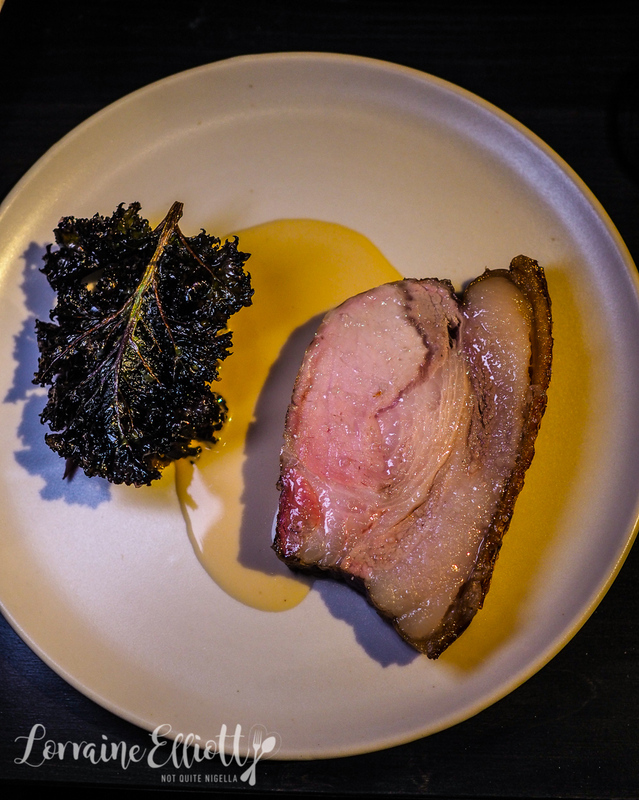 It is paired with a crispy fried kalettes hiding a layer of sauteed kale and pickled walnuts that have been preserved in an allspice malt vinegar. When you get a bit of everything together it's heavenly with the acidity of the kale and the unctuousness of the pork and the crunchy crackling. 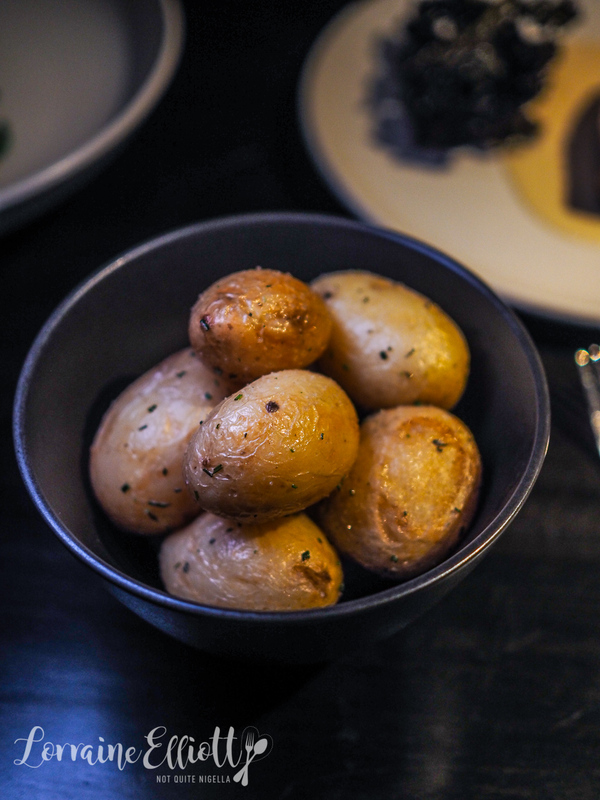 The young potatoes are steamed and then finished in the pan with salt, butter and lots of herbs. Dessert time! 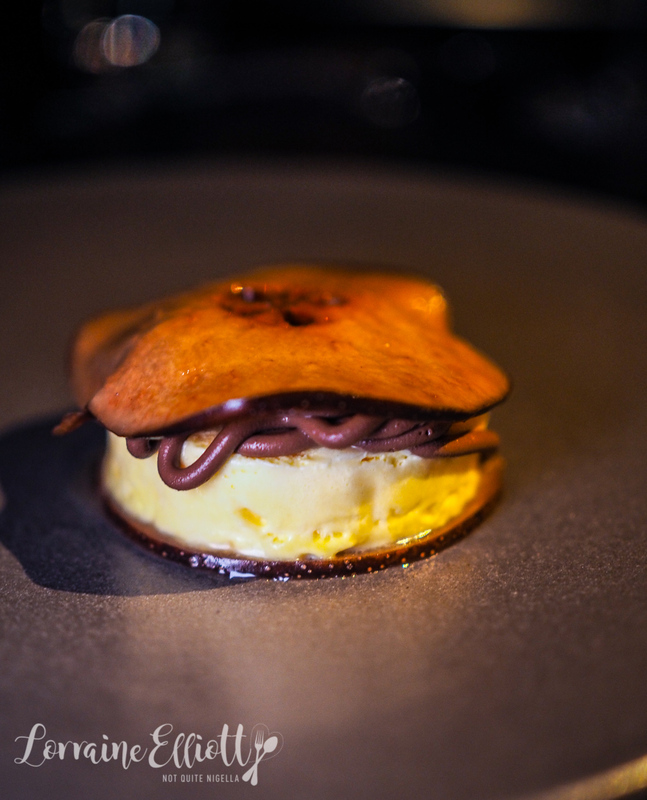 The salted bergamot parfait is served inside two slices of dehydrated and rehydrated smoked nashi pear with squiggles of chocolate ganache. The bergamots in the frozen parfait from the Victoria Highlands are treated in the same way as preserved lemons while the nashi pear is rehydrated in a sweet, young alcoholic spiced ferment with house made koji. My favourite dessert however is the green apple dessert. 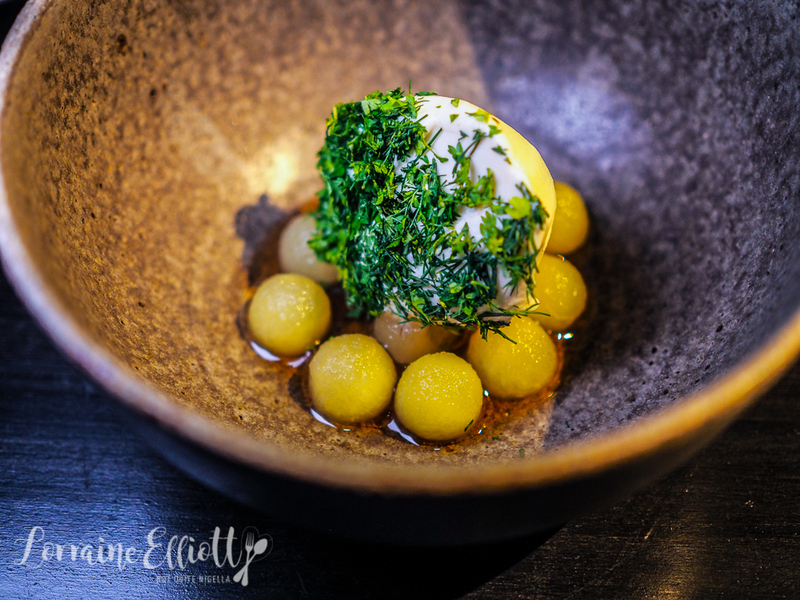 The green apple balls are poached in a elderflower vinegar rosemary lemon and a globe artichoke syrup and are served with a divine chamomile ice cream dipped in dill, chervil and fennel with almond blossom oil to finish. Although I've eaten plenty today I can't help but go back for more. It's refreshing and the perfect course to follow on from the pork loin and while the herbs look heavy handed they aren't at all. Oh and the name? It's pronounced in the same way as the name Lisa. So tell me Dear Reader, do you try and get to restaurants when they first open up? And do you like hugs? Either real ones or ones via food? Which dish did you like the look of? 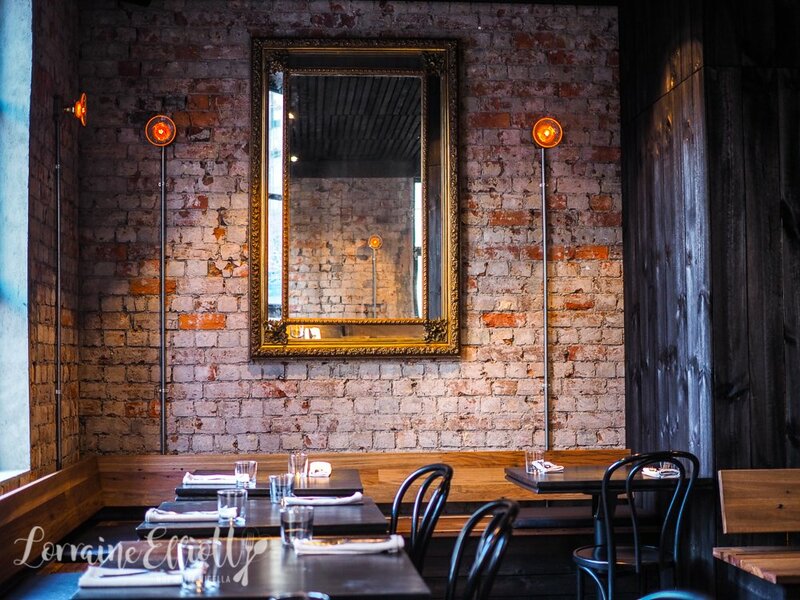 travelSunda: A Seat At Melbourne's Best New Restaurant? 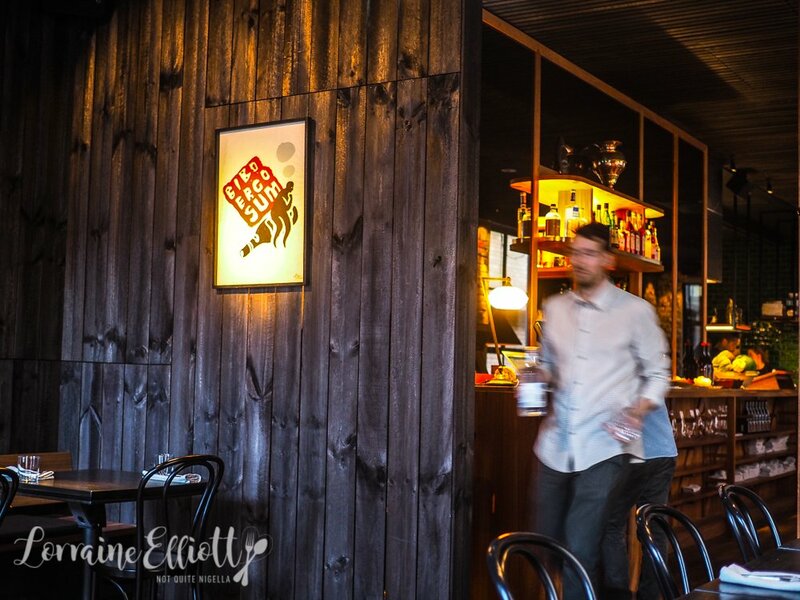 travel Sunda: A Seat At Melbourne's Best New Restaurant?